Zora Neale Hurston, the outspoken author of African-American literature, wrote much about Eatonville, the historic African American community where she grew up. Hurston is renowned not only for her literary skill and wit, but for the anthropological concepts and methodologies which she brought to her work. The UCF History Department exhibit, Zora Neale Hurston’s ‘Native Village’: Historic Eatonville Remembered, hosted on the first-floor gallery wall in the John C. Hitt Library, explores Hurston’s anthropological research into the people, history, and culture of Eatonville. Curated by UCF Associate Professor of History and Director of Public History Dr. Scot French, the exhibit features photographs related to Hurston’s investigation of folklore and song in Eatonville, an outline of Eatonville’s history, covers from Hurston’s books, as well as recently discovered historical sources related to the community. According to French, the exhibit is intended to afford visitors an opportunity to explore these concepts through Hurston’s eyes and voice. After leaving Eatonville, Hurston took several trips to research and collect ethnographic materials, such as stories and songs, from the community’s local residents. Hurston later incorporated much of this material into her work, most notably in her novel Mules and Men. 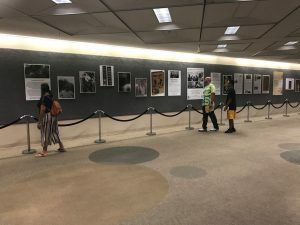 The black-and-white photographs featured in the exhibit date from a 1935 trip to Eatonville Hurston took with the ethnomusicologist Alan Lomax. The songs collected on this trip would later end up in the Library of Congress. The exhibit itself is part of UCF’s Zora! Celebration, a commemoration of both the author and the thirtieth anniversary of Eatonville’s ZORA!™ Festival. In addition to the festival and exhibit, the celebration features conferences on African American research, a lecture series, and an author reading and Q&A. More information can be found at dtl.ucf.edu/ucfzora. The exhibit is featured with the support of the Zora Neale Hurston National Musuem of Art, where several of the pieces originate. Exhibit dates: January 2 – February 28 2019.